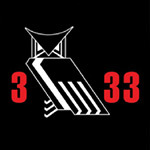 3:33 shrouds its identity in mystery, letting the music speak for itself. The group is currently working with Parallel Thought, which has created a solid reputation over the past decade for their work with underground hip-hop notables such as MF Doom, Aesop Rock, and most recently Del the Funky Homosapien. Parallel Thought believes 3:33 will introduce the world to a new style of music altogether, pushing the boundaries of experimentation by sending their audience into an abyss of musical discord. Their music is tense and fiercely experiential; a roller coaster ride through moody beats, haunting jangles, and shrieks that will disquiet the soul. Their sounds are otherworldly, guttural, deeply primal, and sometimes mad; 3:33 masterfully brings this motley of noises into communion, and the listener is transported into a world of dark imaginings. Packaged in a deluxe ''mini LP'' including thick, ''tip on'' sleeve.